The Place Keong Saik Road is one of my favourite dining street with its charming heritage shophouse restaurants with a rather diverse range of cuisines. Meet Meta, one of the newest modern Asian restaurant to open about a month ago, helmed by Chef Sun Kim with previous stints in the acclaimed Tetsuya Sydney and Waku Ghin Singapore. With a modern sleek interior of 30-seater, we feel that the black marble counter seats offer the best dining experience as we get to interact and ask the chefs any questions when any of the dishes piques our curiosity. The Food There is no a la carte option here, as the restaurant offers a choice of three set dinner menus currently, namely five-and eight-course Tasting Menus and a five-course Vegetarian Menu, which will change every season. We had the eight-course Winter menu at $128++ per person, starting with the fresh Oyster with Pomelo, Lemon and Ginger. The refreshing lemon and ginger seasoning worked well on the Irish Oyster, while the pomelo flesh balanced the overall taste with a tinge of sweetness. This was a promising start. The next appetizer was the Amaebi with Yuzu and Apples, which showcased the Japanese sweet shrimp with a slightly charred prawn head. This is one of my favourite of the night, the Wagyu Tartare with Egg Jelly and Korean Pear Kimchi. The inspiration of the well-seasoned beef tartare was drawn from the Korean beef bulgogi, mixed with bulgogi sauce. The other interesting element was the julienned pear, seasoned with Chef Sun’s homemade kimchi dressing, which added a refreshing touch to the beef. Together with the crunchy puffed rice, this whole dish felt like a deconstructed Bibimbap. On to the more savoury dishes, the Slow Cooked Tasmanian Grass-Fed Beef Short Rib with Parsnip was sous vide for over 30 hours, paired with pickled oyster mushrooms, charred spring onions and a smooth parsnip puree. I enjoyed the clear broth of the Cod fish with Clams, Fregola and Basil, which accentuated the freshness of the ingredients at play. 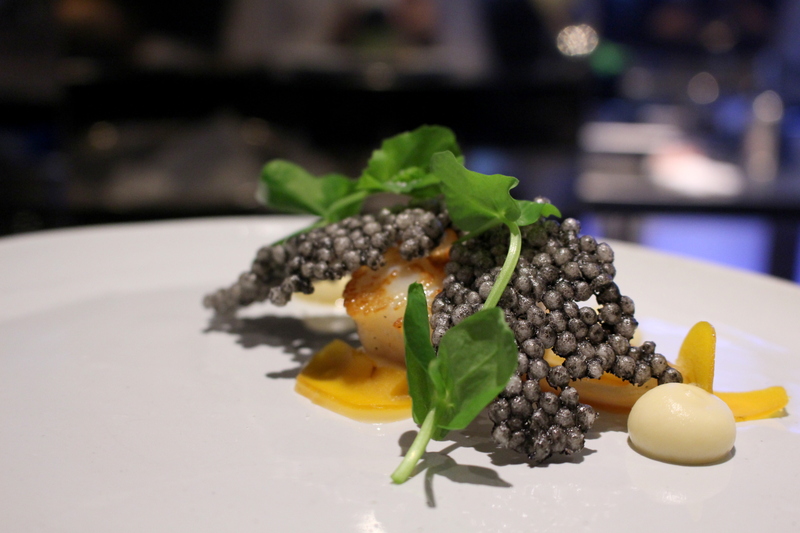 There is nothing not to love about the Hokkaido Scallops with Endive, Miso and Squid Ink (crackers) with cauliflower puree. Squid ink crackers, just how unique is this? I thought the savoury items were pretty well-executed so far, not knowing what was installed for the last few dessert dishes were equally, if not more impressive. This amazing orange golden dome is just one of Pastry Chef Tammy Mah’s innovative creations, the Blood Orange Cheese Cake. The outer layer is citrus gel that encompasses the citrus cheesecake and a dark chocolate shell with a blood orange liquid center. Poke it through and have it in one go, it was indeed a good prelude to the last few dessert items. It is hard to imagine wasabi in a dessert dish but this combination had me thinking about the infinite possibilities of any dish. This White Chocolate Wasabi Cream with Sesame Sponge and Yoghurt did not merely score on its presentation. The black sesame sponge, yuzu sabayon and wasabi spiked white chocolate cream were all intricately balanced such that I experienced so many flavours all at one go, without compromising or masking the taste of any key ingredient. Finally the last surprise dish of the night was The Rock, which I do not want to spoil the surprise by revealing more details of the dish. One clue is that this is a liquid nitrogen inspired dessert, go figure! Rants As you can imagine, the 30-seater space is not huge, with limited tables. It is meant to be an intimate dining space, which means it’s not so ideal for big groups. Will I Return Again? Meta is definitely one restaurant to look out for this year. I like its bold twist and play on ingredients, which surprises the senses and palate most of the time. Service during our visit was generally sincere and unpretentious, which left another positive note on me. Because of your wonderful review, I know where I will be dining next week! Thanks! Wah don’t like that haha, we have pressure you know. Hope it will be a good meal for you too!